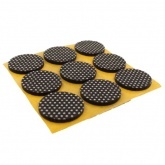 These brown non-slip coated self-adhesive felt pads are an excellent solution to noisy chairs & furniture being dragged across a wooden floor and also serve to protect your floor from damage. 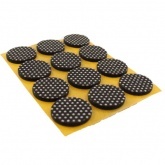 Suitable for tables, chairs, coffee tables, sofas and other furniture, these pads are available in many sizes and shapes to suit your application. 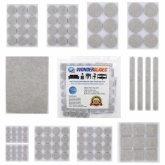 Please make sure the surface is totally clean, dry, and free of residue before affixing.